You must sign into your myHangout account in order to contact mockingbanjo. In the beginning were the sixties and the seventies and the common passion for the Beatles, the Byrds, Bob Dylan, CSN&Y and the Backersfield Californian Country music from Buck Owens to Herb Pedersen and Chris Hillman, even if Ron Martin comes from Eden, North Carolina, and Marco Zanzi from Varese. Born and grown in North Carolina, since schooldays Ron plays in different bands: 'Kaleidoscope', 'Wampus Cats' and 'Shiloh' are the ones thanks to which he reaches a fair popularity. Marco Zanzi follows a similar path, in the beginning he plays and sings in small neighbourhood bands, but later he has more significant experiences in 'La Signora Stracciona' and 'The Steamboat Willie' and with them he plays throughout Italy. In that period he was also definitely conquered by the Country Rock music and by groups like Poco, Flying Burrito Brothers, Nitty Gritty Dirt Band and Eagles: through them (and especially the 'Will The Circle Be Unbroken' project) he discovered the Bluegrass and soon became a 5-String Banjo lover (a hard-to-find and almost unknown instrument back then in Italy). But the Web was the real meeting point for Ron and Marco. In fact, the diffusion of the Internet allows them to know each other thanks to a Website about the Byrds (My Songbook, realized in 2000 by Zanzi and David Reynolds) but above all thanks to the common and active participation at various newsgroups: 'Gene Clark List' and 'Byrdmaniax', but mainly 'Acousticharmonies', which is an incredible resource both musical and human. Here Ron and Marco collaborate for the first time on a musical project and they are involved in the making of a CD which involves musicians from different countries (USA, Canada, Japan, Ireland, Holland…). 'Piedmont' stands for the Italian 'pedemontana', because Ron lives at the foot of the Blue Ridge Mountains, in the Appalachians chain and Marco lives on the offshoots of the Prealps. Therefore, here it is the 'Piedmont Project' (then evolved in the Piedmont Brothers Project) that combines both common musical interests and environmental similarities. In Spring 2007 Marco Zanzi goes to Ron in the USA, he knows his companion Suzon, his family, his friends and he finds a landscape that recalls Varese very much. 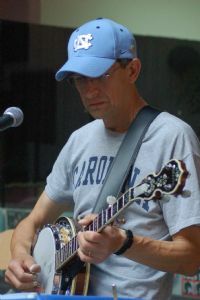 With his American friend he goes to the 'Merlefest', probably the most important music festival dedicated to the 'Americana' genre (acoustic, bluegrass, country, folk, blues, celtic…), and he records three songs at the Flyin’ Cloud Studio of Doug Rorrer, in Eden, NC. Here arises the idea to create 'The Piedmont Brothers Band', where the two brothers are Marco and Ron and the band is composed of old and new musician friends having in common the same passion. Thanks to the Internet again, the music knocks down the barriers and flies over the Ocean; Ron sends his original pieces (Martin is a composer too), Marco arranges and reworks them thanks to his competence. He involves his friends, records and sends to Eden where Ron listens to them, comments on them, goes to the Studio and records his voices with the precious help of the 'Chief engineer' Doug Rorrer. And then he sends them to Italy for the final mixing. During this long process Francesco 'Chicco' Comolli has become an invaluable partner of Ron and Marco contributing to establish the 'Piedmont Brothers Band' core group. A long- time friend of Marco and an extremely talented musician, Chicco (pronounced Kikko) played lead guitar and mandolin with 'The Steamboat Willie' and the 'Hot Country' (a Country Rock group who reminds Emmylou Harris' 'Hot Band'); his main influences are Norman Blake, Tony Rice, Doc Watson and Albert Lee. And finally the 'Piedmont Brothers Band' meets: Ron crossed the Ocean in July 2008 to plan in Italy with two targets: the first was a couple of concerts (one of which was settled on 12th July in Rasa di Varese within an exhibition known as 'The concerts at Casa Tognola'), while the second was the refinement to the first CD of the band named 'Bordertown', an especially significant title because both Eden and Varese are actually 'border towns' - Virginia and Switzerland the respective landlines. The CD will be released between September and October 2008 and it will contain mainly Ron’s own compositions, arranged and produced by Marco Zanzi. From February 2003 Ron Martin fights against a liposarcoma that obliges him to constant inspections and treatments, although it is positively treated. But Ron is a fighter: he fights with the medicines, he fights with the Faith, but also with the music, that is his inseparable fellow. In 2005 he makes with the help of his friends a CD called 'The Circle' with the Flyin’ Cloud Records' label, in which he reveals his gift as interpreter and whose part of the income goes to support the Cancer research through the 'Liddy Shriver Sarcoma Initiative'.